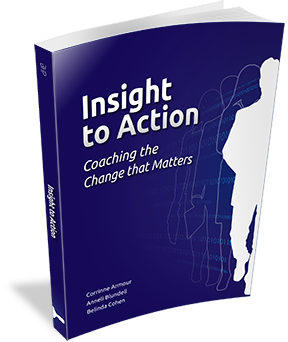 Insight to Action: Coaching the change that matters is an iWAM consultant’s resource that provides a practical tool to help their clients translate insight to action. With these 52 stand-alone self-coaching pages, you can continue to facilitate your client’s development after the coaching session or workshop is complete. Each page provides your client with a targeted reference to embed the learning and insights from the iWAM debrief. Your clients will be empowered to drive their own development by selecting an accessible pathway for change from a range of options. Bridge the application gap and direct their continued learning and action through practical self coaching activities after your debrief? Maximise learning impact by reinforcing and deepening knowledge of the concepts? See themselves as others see them and bring conscious awareness to unconscious behaviours? Identify specific actions to undertake on their own and incorporate in a self-development plan? Develop an accessible pathway for change that allows them to choose their preferred approach? It’s a must-have for every iWAM coach! This instrument is well laid out and is very convenient to use in eBook format – you can easily navigate to the right page linked to the iWAM pattern you are working on with the coaching client. This Resource is not for people who want to learn how to coach. This Resource is for iWAM consultants who want to maximise ongoing learning for clients beyond the iWAM debrief or workshop. After the iWAM debrief in our leadership workshop, the self-coaching pages gave each person specific actions they could take to achieve their development objectives. Using these coaching pages we have been able to support our clients to translate action into insight. We’re excited to share this material with you, which is provided in digital format so you can print individual pages for clients when ever you need them.